It's not me that still has laundry on the love seat from last week. It's not me that forgot how to dress for cool weather and wore flip flops with a long sleeved top and pants. It's wasn't me that set the house alarm off twice( or 3 times) this week to let the dogs out in the morning oh and once more when I accidently pushed the alarm key chain. It wasn't me who packed enough clothes for a month when I thought I might have to go up north after my dad had a heart attack. I live in California, and I wear flip flops with everything and to everything except job interviews! Banquets, meetings, presentations, school, work... I hate real shoes! And I also take forEVER to unpack when I go places. I went to Alabama recently, and it took me an entire week to unpack everything! I do not like to unpack things either and I also pack a million things to go places too, even if it is for a couple days. The laundry thing. . . I have 3 baskets from last week still waiting to be folded and put away. Shoes. . .I don't like "real" shoes either, but because I am from the frozen tundra I have got to start wearing "real" shoes soon!! 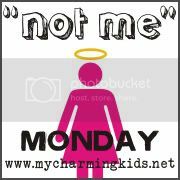 Thanks for sharing your "Not Me Monday" Moments!! My parents live in WI so I know all about the Frozen Tundra. It is always a crazy christmas visit with as much stuff we have to take and NO Flip Flops!